“Olive, meet Santa Claus,” Santa meet Olive.” This is Olive’s first encounter with the great bearded one. 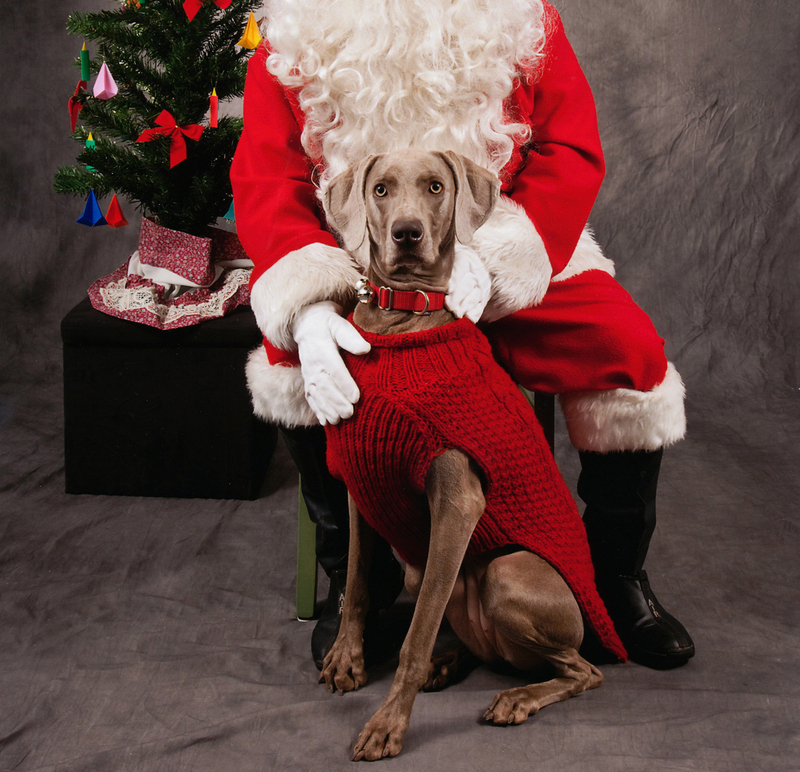 We drove out to K-Nine Coaching in Olde Lafayette Village last weekend for Olive’s photo session with Santa. On the way in, we run into Luna and her owners. Luna is a sweet, beautiful blue weimaraner and a friend Olive met during her training classes last year. Other dogs and their owners are milling about; a trio is getting their picture taken as we speak. It’s Olive’s turn and she confidently strides over to where the giant red and white “fleece toy” is sitting. “That’s Santa, Olive,” I quietly inform her. Beverly Burke, the photographer, approaches Olive to meet her but Olive has her famous orbs trained on Santa. I imagine that Olive is wondering whether this red-and-white-furred-object is man, beast or something else. She circles the set, passing the klieg lights with the nonchalance of someone used to having the paparazzi stalk them. She noses the small Christmas tree and finally walks over to Santa. Leave it to my dog to circle the action from the perimeter before deciding to engage. Now getting her to sit still is something else entirely. Of course, my little scent hound is exploring Santa from shiny black boot to thick white beard. Santa grabs Olive’s collar and I move in and command her to SIT. The photographer’s camera snaps away. After her session, we go next door to the specialty pet store and I fall in love with a wool sweater designed like the sock monkey! I would have gotten it for Olive in a heartbeat except I was pretty sure she’d never stand for the attached hood with monkey ears. And there was no way I’d be able to walk my regal-looking pooch wearing that thing without feeling like a freak. We both have too much dignity to do that. Today, we went back to Lafayette to pick up Olive’s photo. It was a bright, beautiful crisp winter day. A great day for a drive with my dog along peaceful, open country roads, listening to Bruce Springsteen’s “Outlaw Pete,” some classic rock and even Christmas Carols. We watched people at cut-your-own Christmas Tree Farms tie their freshly cut douglas firs, scotch pines and fraser firs to the roofs of their cars. We passed clusters of aging farm silos standing side by side all by themselves, having seen better days long ago. For some reason, this music is the perfect soundtrack to the peaceful rural farmland that we’re driving through. They didn’t name this town “Tranquility” for nothing, I think to myself. I pick up Olive’s 8×10 glossy of her and Santa from the passenger seat and look at it again. “NICE PICTURE OLIVE. NO ONE WOULD HAVE ANY IDEA THAT YOU ARE SUCH A GOOFBALL AT HEART.” For once, Olive is ignoring me. She’s staring out the window watching the exquisite scenery pass by. beautiful pic of Miss Olive and Santa… a classic for the ages! You look so noble, Olive! Why thank you so kindly Chancy, Mumsy and Crew. I’ll let Patti know. Please be patient with her; it might take her a while to figure out how to dot his and she’s not sure of protocol. This is your sister Heidi, no really we are from the same litter, although I’m sure I don’t remember you and you likewise! My people read me your posts all the time, and they think we might really be twins =) . I live in New Jersey too! maybe we should get together sometime! P.s you are super brave for getting your picture taken with Santa, I probably wouldn't have gone near him! Cool. Why don’t you get my phone number from our breeder-mother and give me a call. Cropping his head off is the way to go! We rather see Olive than him anyway. Why thank you so kindly!